Dog attack kills a man and injures a woman at the Salton Sea community of North Shore. The victim of Tuesday’s fatal dog attack in North Shore was identified as a 65-year-old resident. Emilio Rios was pronounced dead at 6:32 a.m. in front of a home at 70-670 Sea Gull Drive, according to the Riverside County Coroner’s office. 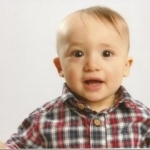 Riverside County sheriff’s deputies found him at about 6:15 a.m. Shortly after, they heard a cry from a woman who was being attacked by dogs nearby. The officers sounded lights and sirens, which scared the dogs away, and paramedics transported the victim to a local hospital, where she is being treated for major injuries. Sheriff’s deputies and officers from the Riverside County Department of Animal Services captured the dogs, which they believe were pit bulls. One was extremely aggressive, according to the sheriff’s department, and had to be tranquilized. The dogs are quarantined at the Coachella Valley Animal Campus in Thousand Palms. 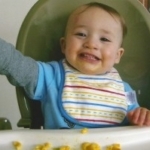 Rios was a good man who enjoyed laughing and spending time with his family, a family member said. Michelle says the dogs are owned by her neighbors. “The dogs belong to our neighbors, they coincidentally probably jumped it (the fence) or they slipped through when the neighbors left to work,” Rodriguez’s daughter Michelle said. Riverside County Sheriffs did not confirm who the dogs belong to. 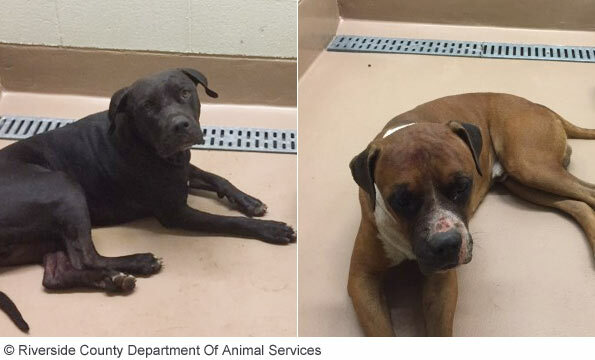 The County’s Department of Animal Services took both dogs into custody. Officials are recommending people be extra careful with stray dogs. They also want to make sure people call animal control services if they ever see one. NORTH SHORE, Calif. – The Riverside County Department of Animal Services has released photos of the two dogs detained after a deadly attack Tuesday morning in North Shore. A man and woman were attacked by at least two dogs near Seagull Drive and Dolphin Drive at 6:15 a.m. The sheriff’s department was on scene investigating and the two dogs were detained. Deputies arrived to find the man deceased in the front yard of a home located at 70670 Seagull Drive. 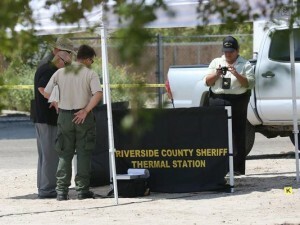 The Riverside County Coroner’s Office identified the victim as 65-year-old Emilio Rios. 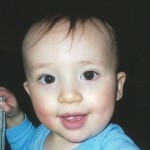 His family spoke to KESQ and CBS Local 2 Tuesday afternoon. Emilio’s son Jorge Rios told us his dad was a retired gardener and he regularly helped his neighbors with their laws and gardens. His dad apparently went over to water his neighbor’s plants early on Tuesday when he was attacked by the dogs. Neighbors noticed the water from the hose running and discovered his body, according to his family. They called police, and while officers were investigating, they heard a woman crying for help as she was being attacked by two dogs nearby, according to the sheriff’s release. The lights and sirens from the responding patrol car scared the dogs away and an ambulance took the woman to the hospital where she’s being treated for major injuries, officials said. My mother is so thankful for every donation and the continued support and prayers. Something like this will take a life time to over come. She is passing through a very traumatic stage , even stepping out of her home or looking out the window to the scene of the crime brings a constant reminder of the horrible thing she went through. She continues to see doctors to make sure her open wound stays healthy and clean. Unfortunately shes still uninsured and has to pay for pain medication out of pocket with whats left from her last check. 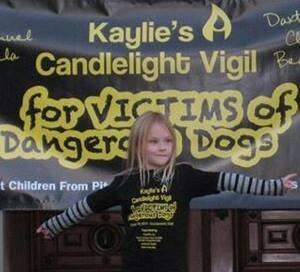 So every bit that’s donated is a reassurance that her story is not forgotten and that it touches many hearts. I ask you share this story with others to help her story reach across the country and touch others because something like this cant be forgotten . Thank you so much and may god multiply what kindness you’ve given. 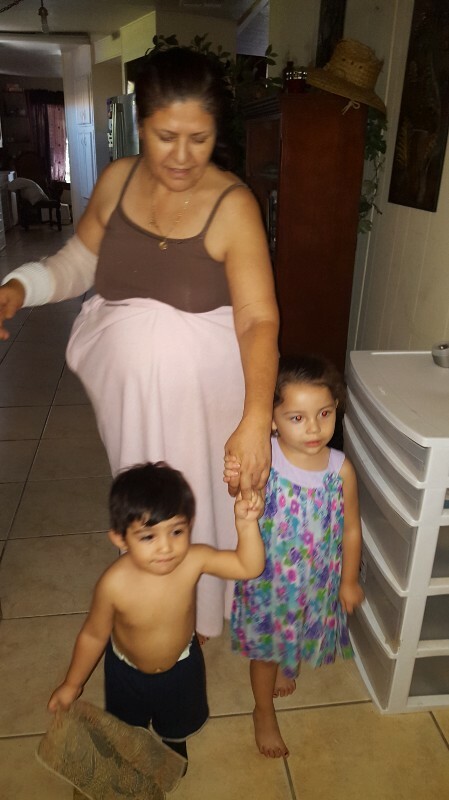 My mother Felipa Luisa Rodriguez was viciously attacked by multiple pit bulls Tuesday September the 8th at 6:15 am in the unincorporated town of North Shore, if it was not for paramedics and police officers my mother would not have survived this deadly attack. She was transported to JFK Memorial Hospital where she waited 12 long ours to be taken into surgery where they attempted to close her wounds. She received 7 smaller repairable bites on the right arm but the 8th was unable to be closed. In order to get her arm repaired she will need further surgery where they will place skin grafts over her newly formed muscle and skin which was mauled away. Her right hip/stomach area as well as back side was also bitten, causing intense radiating back pain. Unfortunately she will not be able to work for several months and has no health insurance at the moment she will need further medical care to keep her wounds clean and to better her physical movement. So we are asking for donations to cover her hospital bill of 5,000.00 at the moment. Anything will help we appreciate all donations and prayers and all the support in this hard time our family is facing, god bless you all. BY ALI TADAYON / STAFF WRITER – Published: Sept. 9, 2015 Updated: 6:03 p.m. The Riverside County Coroner’s Office on Wednesday, Sept. 9, released the name of a North Shore man who died in a dog attack Tuesday. Emilio Rios, 65, was found dead at 6:32 a.m. Tuesday in the area of Sea Gull and Dolphin drives, according to a Coroner’s Office news release. A woman also suffered major injuries in the attack. Riverside County sheriff’s deputies arrived to the front yard of a home in the area after receiving a report of the attack, according to a Sheriff’s Department news release. The man was dead and the woman was being actively attacked by the two dogs, Deputy Armando Muñoz wrote in the release. He stated the officers responded to the woman in their vehicle with lights and sirens on, causing the dogs to flee. The woman was transported to a local hospital. Animal control officers later found both dogs and captured them, according to Muñoz. 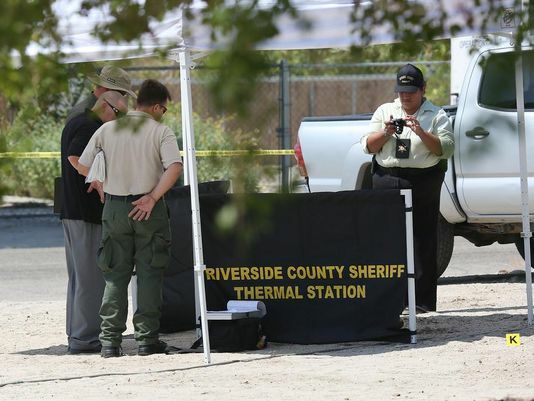 The Riverside County Sheriff’s Department is asking anyone who may have information on this case to contact its Thermal station at 760-863-8990. ‘A person should not have to worry about perishing from an attack by an animal,’ official says. BY DAVID DOWNEY / STAFF WRITER – Published: Sept. 9, 2015 Updated: Sept. 10, 2015 4:00 p.m. This week’s brutal – and fatal – attack by a pair of pit bulls in the remote Salton Sea community of North Shore has rekindled concern about the damage so-called bully breeds can cause and spurred calls for pet owners to be vigilant and prevent dogs from running loose. And it was entirely unnecessary, Welsh said. But that’s exactly what happened Tuesday morning. 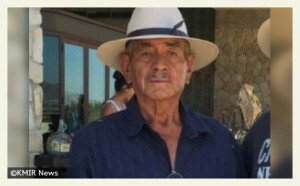 A man identified as Emilio Rios, 65, was found dead at 6:32 a.m. Tuesday in the area of Sea Gull and Dolphin drives, according to a Riverside County coroner’s news release. A woman suffered major injuries in the attack and was taken to a local hospital. Riverside County sheriff’s deputies responded to the front yard of a home to find a man dead and a woman being attacked, according to Deputy Armando Muñoz. The dogs ran off when deputies arrived, rolling up with lights and sirens. Animal control officers later found both dogs and captured them. Welsh said both were mixed-breed pit bull males. He said authorities were trying to find the dogs’ owners. UPDATE 9/10/15: On Tuesday, Emilio Rios, 65, was savagely killed by two pit bulls in North Shore, an unincorporated community in Riverside County. The dogs also attacked a woman who came to his aid. John Welsh, a spokesman for county animal services, said, “Remember the old days when the pioneers came and had to worry about wolves? We are not in those days anymore. A person should not have to worry about perishing from an attack by an animal,” he said. Not just an “attack by an animal” mind you. 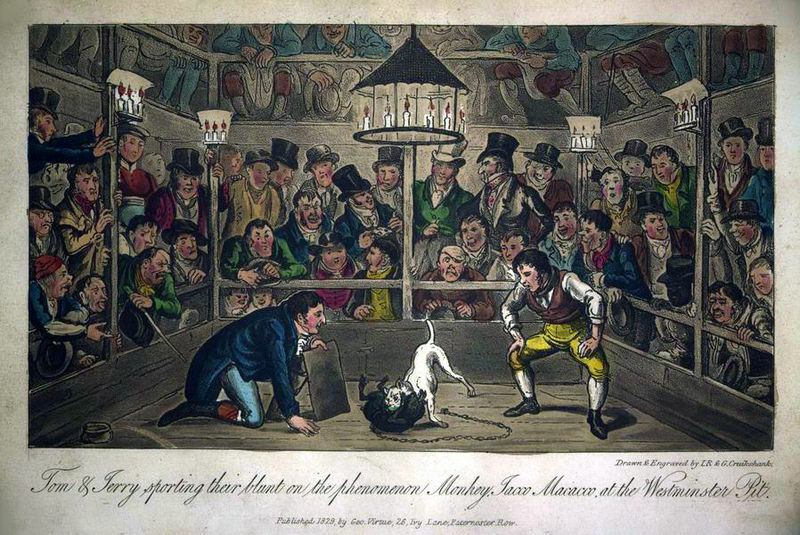 A crushing fatal attack by a domesticated dog breed selectively bred to fight to the death in a pit. Thanks to dogfighters, out-of-control pit bull breeding and out-of-control pit bull “rescuing” and adoptions by out-of-control “humane” groups, a person does have to worry about perishing or being permanently maimed in a violent pit bull attack today. If you have not seen the images of what happened in New York recently, you should. After a man blasted a bullet into a pit bull’s head that was latched onto a man’s face, it took several minutes for the pit bull to release its jaws. We point out these disturbing images because this is what a savage pit bull attack scene looks like. 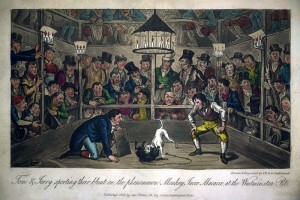 In the case of New York, the dog was shot to death. What do you think the scene looked like when sheriff’s deputies found Emilio brutalized and dead and the female victim screaming while being actively attacked by the two pit bulls? It was a violent, horrific crime scene in North Shore; the same kind that has accompanied pit bull attacks for over a hundred years in this country.